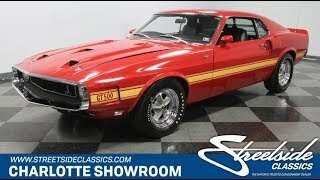 Hi, I am interested in your 1969 Ford Mustang Shelby GT500 (stock #5074-CHA) listed on Autotrader for $124,995. I'd like to get more information about this vehicle and confirm its availability. The 1969 Ford Shelby Mustang GT500 was the last evolution, and arguably, the best of the breed. These rare snake-bitten Stangs truly got their own identity to go with the big Cobra Jet V8. So to find one in the right colors, four-on-the-floor, and a highly detailed restoration makes for a truly powerful collectable. Candyapple Red is always a color in demand, because the bright color is the perfect way to announce this serious sports car. But just because its a favorite doesnt mean its common only 304 were finished in this paint code. This factory-correct color looks great today thanks to a professional respray, and in fact, the whole car was given a full professional restoration in 2006. There has only been about 1,000 miles added on this GT500 since then, so you know it has been babied. The unique front ends deep recess looks like its ready to consume every lesser car out there. The full-length gold stripe package gives it the unmistakable appearance of a true American racer. The sequential taillights and center exhaust meant everyone you pass gets to see some swagger. Of course, this car was built to be cool literally with three NACA ducts on the hood, two more extractors, and inlets to rush air over every single wheel/brake. All the right badging is still in place with the coiled snake in the grille, 428 callouts on the fenders, and the unmistakable SHELBY in block letters out back. But the insignia you might love the most are the little cobras in the center cap of each of the cool cast aluminum wheels. Its all part of the details that tell you then took their time restoring this one. One look inside, and you can tell this is a classic built for performance. After all, you get the premium high-back bucket seats with the knit pattern and a cool red racing stripe across the top. Sporty Shelby upgrades included a roll bar with shoulder harnesses, and a center console with its own auxiliary gauges angled towards the driver. But Fords aim in 69 was to make sure that when their customers paid a premium for these Shelbys they got a premium feeling, too. Thats why you have a three-spoke wood steering wheel with the Cobra logo, and more wood-like treatment across the full gauge panel. Plus, the level of care in the restoration is once again apparent in the details everything from the shifter knob to the AM radio thats still cranking out tunes. The optional Sport Deck rear seat even folds flat for the proper racer look. Fords 428 cubic inch Cobra Jet engine was one of the most potent machines on the street. In fact, Ford was famously under-rating this big block at 335 horsepower. The enormous torque will spin the tires on demand, and its one of the few cars that can approach the top end of its speedometer. The motor youre looking at has an exceptionally fresh look and even the decals are correct. It really appears stock right down to the Ram Air induction. So its more evidence of the detailed restoration. And as you look at undercarriage photos, you realize no area was missed when investing in this GT500. But more than just a looker, this coupe is a true drivers machine. The V8 inhales deeply with a four-barrel carburetor, and the growl of the exhaust tells the world this is something fierce. The close-ratio four-speed manual transmission means youre in complete control over the big block power and muscular soundtrack. Plus, theres power steering, power brakes w/discs up front, and a Traction-Lok limited slip rear to give you full control of this snake-bitten Mustang. The included Marti Report shows you that this one has been restored correctly back to day one right down to the Goodyear Polyglas tires. A solid investment and a solid driver; its time you put a rare snake in your garage. Call now!